Once the youngest designer in GM’s history, Peter Brock left Detroit at age 21, bound for California and, he envisioned, a career racing cars. There, he landed a job with Carroll Shelby, first as a high-performance driving instructor, and later as the designer of numerous Shelby racing and road cars. Brock’s latest book, The Road to Modena: Origins and History of the Shelby–De Tomaso P70 Can-Am Sports Racer, tells the story of his years at Shelby American, detailing his work on the Italian-American hybrid meant to dominate the Can-Am series. Remaining photos by Mark J. McCourt. The Road to Modena covers far more than just Brock’s design work for Shelby American. 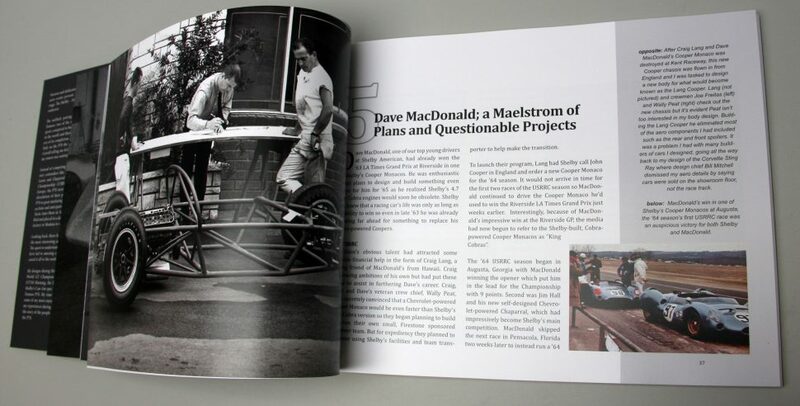 Various chapters discuss the United States Road Racing Championship, the SCCA-sanctioned series that saw Shelby take its first manufacturer’s championship in 1963, and eventually gave rise to the legendary Can-Am Challenge series; the rapid growth of racing on both sides of the Atlantic; the move from front- to mid-engine car design; the growing importance (and understanding) of aerodynamics in race-car design; and the cultural differences between building cars in America and building cars in Italy. Brock also covers the all-too-brief rise and premature death of Dave MacDonald, killed in a crash at the 1964 Indianapolis 500. A fearless competitor who gained acclaim racing Corvettes, MacDonald delivered the Shelby Cobra’s first competition victory before going on to pilot the Shelby King Cobra (a reworked Cooper Monaco sports racer) to high-profile wins at the Los Angeles Times Grand Prix and the Monterey Pacific Grand Prix. He was successful behind the wheel of the Brock-designed Cobra Daytona Coupe, too, and even dabbled occasionally in NASCAR. When Al Holbert crashed MacDonald’s Cooper Monaco (known as the Lang Cooper, for its Craig Lang sponsorship, but raced under the Shelby banner), Brock was tasked with designing a new body for this Lang Cooper, incorporating his knowledge of air flow and downforce. MacDonald was killed before he had a chance to drive this version (which emerged, to Brock’s dismay, in a radically redesigned form), but the groundwork laid for this sports racer would later form the basis of the Shelby–De Tomaso P70. And then there’s the compelling story of the P70 itself, a project that arose from Carroll Shelby’s need to have contingency plans for his contingency plans. When the Cooper-based King Cobras proved obsolete, Shelby turned to Alejandro de Tomaso to produce a lightweight 7.0-liter V-8, based upon Ford’s aluminum-block 289. De Tomaso offered to produce a competitive sports racer in its entirety, based upon a revision of Brock’s Lang Cooper body design. 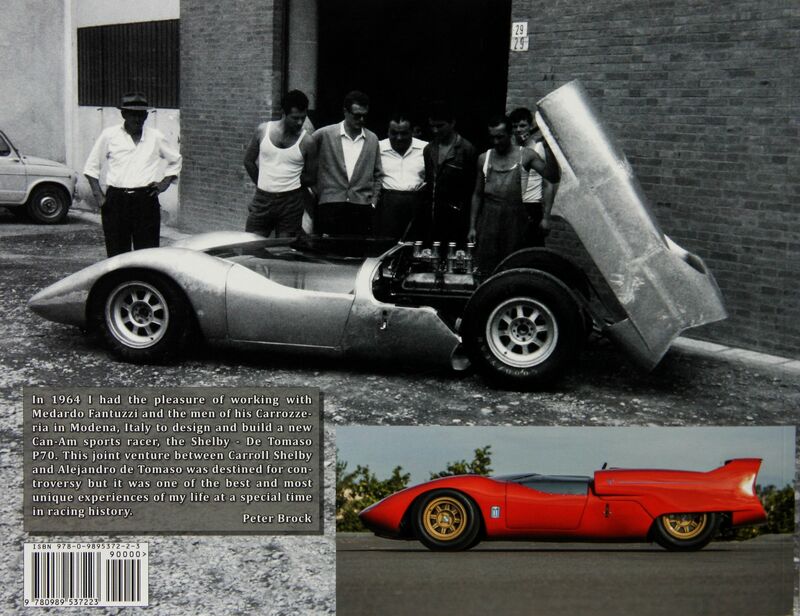 Shelby’s attention was ultimately diverted to Ford’s GT40 program instead of the Can-Am series, and the mercurial Texan pulled the plug on the P70 project while Brock was still in Modena, working with Carrozzeria Fantuzzi (and occasionally, De Tomaso) to finish its construction. Though the P70 never materialized as a Shelby, it did inspire the more conventional De Tomaso Sport 5000, designed for FIA Group 7 competition. Even the P70, shown as a concept by De Tomaso at the 1965 Turin Auto Show, helped draw attention to the boutique Italian builder, putting it on Ford’s radar and potentially securing its future. The book’s 132 pages are full of behind-the-scenes anecdotes, period photos (in black and white and color), sketches, and insights into what life was like during Shelby American’s frantic heyday. For anyone with a passion for racing’s golden era, this is an enjoyable read and a worthwhile addition to the library. 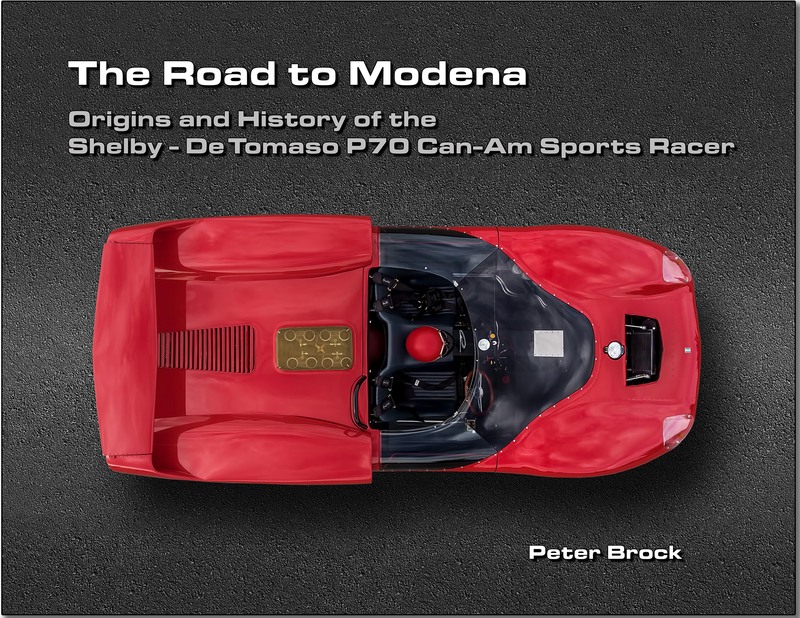 The Road to Modena: Origins and History of the Shelby–De Tomaso P70 Can-Am Sports Racer is available from Brock Racing Enterprises (BRE2.net), priced at $34.95.